There are at least two reasons for an application to register what tfhe user do. The first one and the most important is to see what is happening when a user has an error: what have been done, on which path did he go and what additional data(method parameters, usually) do you need for reproducing the bug. For the implementation I will use log4net , http://logging.apache.org/log4net/ that it is satisfies all three conditions. Now we will see how the log4net writes data and error to a physical storage, in order to can be retrieved later. 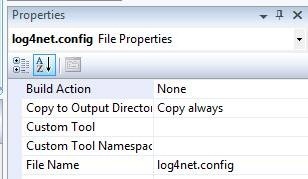 1. add a config file (I will name it log4net.config ) and in properties put “Copy to output Directory” to “Copy always” . Examples of log4net config files you will find everywhere on internet . If you look at the project you will see a bunch of “appenders” : ConsoleAppender, RollingLogFileAppender , SmtpAppender . The appender appends the log to the storage provided (Console, File, Email ). You will find a list of appenders at http://logging.apache.org/log4net/release/sdk/log4net.Appender.html and, if you do not found some appender you can wrote your own – just look at the source code. Now, if you run the ConsoleDemoLog4net project, then you will see how to exception is logged twice and you will find the currentlog.txt in the same folder as your application executable. This was pretty good – but what about putting a log to every method to see where the application flow has been gone and with which arguments? Let’s make the application do this automatically. Do NOT add the log4net code to intercept! PostSharp 1.0 [1.0.12.469] – Copyright (c) Gael Fraiteur, 2005-2008. EXEC : warning PS0064: A new version of PostSharp 1.0 is available. You have currently 1.0.12.469 and you could download the version 1.0.13.630 from http://www.sharpcrafters.com/postsharp/download.